I've been accused of being indulgent on movies, rating them too highly, till I pointed out that we generally watch the highly rated ones, quite unlike Sea Beast. True, the movie may not be on par with the rest of them, considering it was a made to TV SyFy original. But there is a certain perverse pleasure in reviewing it that I cannot wait to get started. 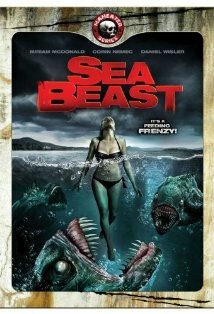 There is a comfort in watching movies like Sea Beast. While you may never have seen this one before, you know everything there is to know about it. You know the characters that are going to get killed off (they are the ones trying too hard to be funny or needy), there will be a hot biologist or zoologist or some researcher (so the audience can get relevant background information), the Sheriff (or other person in authority) is going to pay with his life for doubting the hero, and the proficient with explosives lead figure is going to cause a boom in the creature's nest. In fact the boom towards the end of the movie was actually quite cool - an idea that pretty much demanded the rest of the movie be built around it. Here is a haiku for the movie summary. The movie is rife with zombie-characters, who have no discernible backgrounds or compelling reason for the audience to invest in their well-being. The actors in turn as just a uninvolved in the proceedings, with a distinct Japanese translation time-lag between their facial expressions and dialogue. The monster, a disgusting CGI built, invisible, bear-like, venomous, whip-tongued, anglerfish lookalike ugly creation seems to cause more reaction in the audience than the characters. I think they built he entire monster during post processing and none of the characters got to see it while they were filming. There are enough and more plot clichés, to keep you entertained. And there are just as many disjointed jumps, like a new movie started in the middle of the one you were just watching. But as long as you don't try too hard to make sense of why something is happening, there is enough on screen to keep you interested for a couple of hours. There are a few moments of good old screams thrown in for good measure. It is not worth setting a reminder for, but if you switch to SyFy one insomniac evening and nothing else is on - stick around. It definitely beats tossing around in the bed.